Western blot analysis of extracts from A673 cells, untreated or nocodazole-treated (100 ng/ml, 16 hrs), using 4E-BP2 Antibody (upper) or 4E-BP1 Antibody #9452 (lower). Extracts were treated with lambda phosphatase NEB#P0753 (10,000 U/ml for 1 hour) to dephosphorylate both proteins. 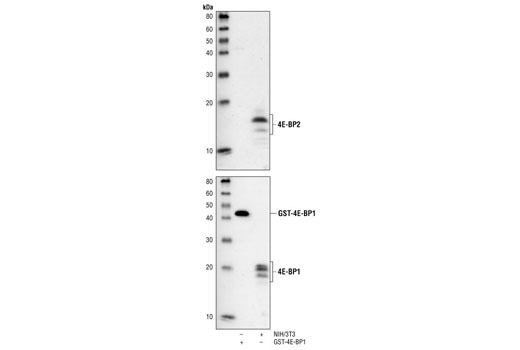 Western blot analysis of bacterially expressed GST-4E-BP1 and of extracts from NIH/3T3 cells, using 4E-BP2 Antibody and 4E-BP1 Antibody #9452. 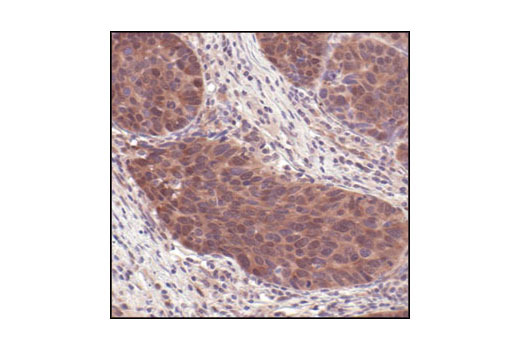 Immunohistochemical analysis of paraffin-embedded human colon carcinoma, showing cytoplasmic and nuclear localization, using 4E-BP2 Antibody. 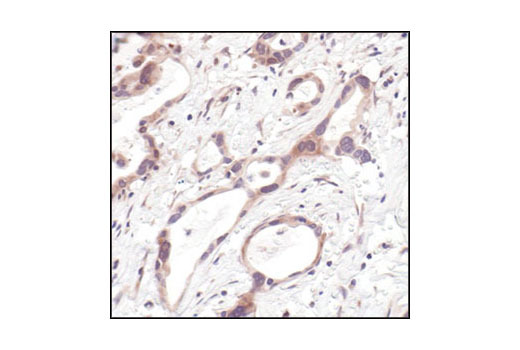 Immunohistochemical analysis of paraffin-embedded human lung carcinoma, using 4E-BP2 Antibody. 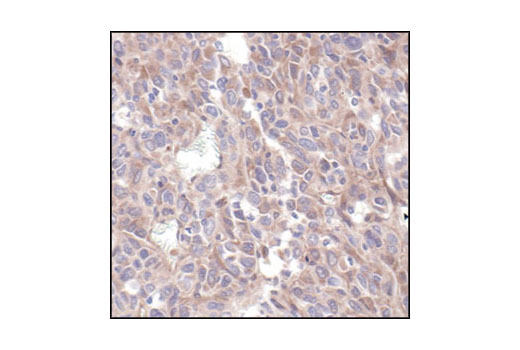 Immunohistochemical analysis of paraffin-embedded human follicular carcinoma (thyroid), using 4E-BP2 Antibody. Flow cytometric analysis of HeLa cells, using 4E-BP2 Antibody (blue) compared to a nonspecifc negative control antibody (red). 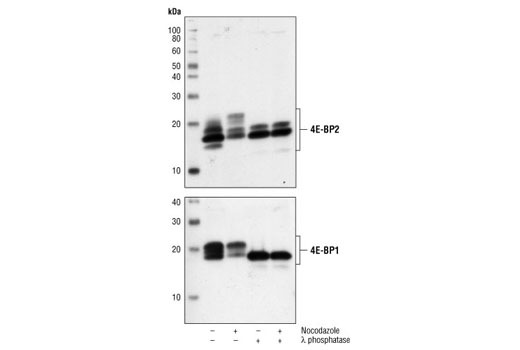 4E-BP2 Antibody detects endogenous levels of total 4E-BP2, independent of phosphorylation. This antibody does not cross-react significantly with 4E-BP1. Polyclonal antibodies are produced by immunizing animals with a synthetic peptide corresponding to residues at the carboxy-terminus of human 4E-BP2. Antibodies are purified by protein A and peptide affinity chromatography. 4E-BP2 and 4E-BP3 share high sequence homology with 4E-BP1, including conservation of the major FRAP/mTOR-dependent phosphorylation sites. Preliminary data suggests that phosphorylation of 4E-BP2 is regulated in a similar manner to that of 4E-BP1, although phosphorylation of this protein has not been as extensively studied (6). Lin, T.A. and Lawrence, J.C. (1996) J. Biol. Chem. 271, 30199-30204.